JORI is presenting no fewer than six new models at the international furniture show in Cologne. Two of them grew from a very first collaboration with well-known figures in the world of design: Fuga by Dutch designer Frans Schrofer, and Daydreamer by German designer Joachim Nees. During IMM JORI is thus unveiling the elegantly feminine sofa SOPHIA, a creation of Swiss designer Cuno Frommherz. The Belgian design studio Verhaert New Products & Services has created a refined variation of the TIGRA model, the sofa TIGRA LANDSCAPE. And French designer Christophe Giraud came up with a re-edition of the JORI classic, GLOVE PURE. The Italian duo Pocci & Dondoli enlarge JORI’s offer of accessories with the graceful side table trio STELLATO. Furthermore, at the JORI stand one can discover the creations of two new collaborations: the balanced tub chair FUGA by Dutch designer Frans Schrofer and the graceful recliner DAYDREAMER by German designer Joachim Nees. Designer Cuno Frommherz translates his poetically romantic vision into an elegantly feminine sofa, which precisely due to its gently curved lines comes across as resolutely contemporary. Like the entire JORI collection, the new sofa SOPHIA Landscape is manufactured with craftsmanship in the JORI production workshops in Belgium and it is available in a wide range of colours of high-quality leather and fabric coverings. Recommended price: as of ± 4100 EUR (incl. VAT) for a sofa of 190 cm. With the ´JORI configurator´ you can compose the SOPHIA sofa exactly as you wish on the basis of the extensive list of options. The DAYDREAMER design represents JORI´s first collaboration with German designer Joachim Nees and it adds a striking new accent to its recliner collection. Fleeing structured, clear contours, the new Daydreamer comes across as strikingly subtle and inviting with its sculpted, curved lines. As fervent adherents of timeless design, functionality and ergonomics, with attention firstly for the needs of the individual user, designer Joachim Nees and JORI have clearly a found match in the new reclining model DAYDREAMER. Averse to any structured, straight lines, the sculpted and flexibly curved design of the Daydreamer clearly adds a new note to the JORI recliner line. The carefully composed combination of refined curves and roundings guarantees its exceptional comfort experience, JORI´s veritable trademark. The fine line finishing of the silhouette gracefully accentuates the roundings of the reclining furniture. The gleaming foot in structural lacquer reinforces the powerful look of the design. Thanks to its compact and extraordinary elegant look the Daydreamer lends a striking accent to the interior. In combi-leather/fabric covering DAYDREAMER looks very refined, but a uni-finishing in supple leather or beautiful fabric also offers a classy accompaniment for the design. 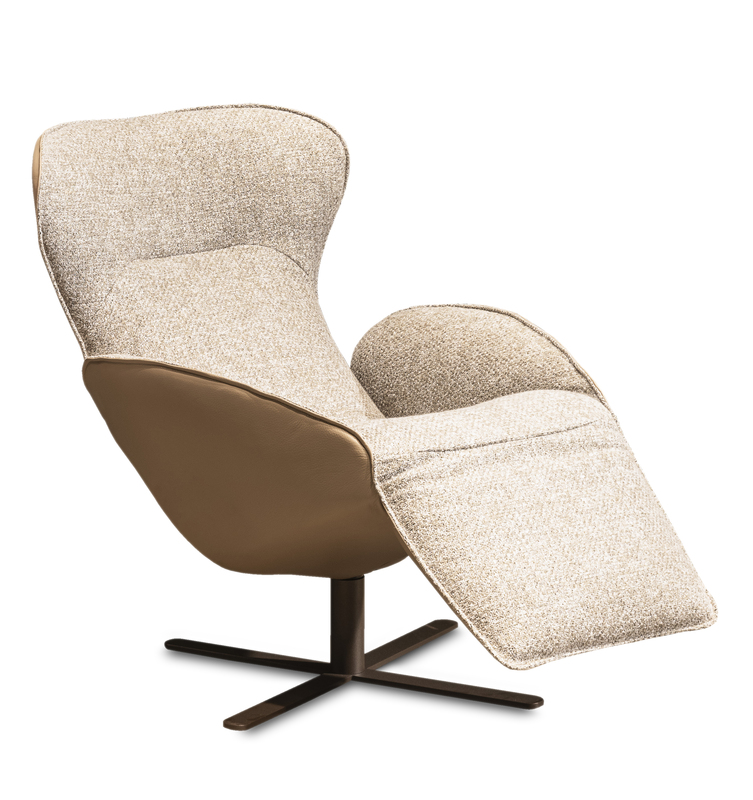 Like the entire JORI collection, the DAYDREAMER recliner is manufactured with craftsmanship in the JORI production workshops in Belgium and it is available in a wide range of colours of high-quality leather and fabric coverings. Chassis: execution in black or mat bronze lacquered. Recommended price: as of ± 3900 EUR (incl. VAT) in leather. With the ´JORI configurator´ you can compose the DAYDREAMER recliner exactly as you wish on the basis of the extensive list of options. Like the entire JORI collection, the FUGA armchair is manufactured with craftsmanship in the JORI production workshops in Belgium and it is available in a wide range of colours of high-quality leather and fabric coverings. A combi-covering in leather/fabric is also possible. Recommended price: as of 1700 EUR (incl. VAT) for a low back chair in fabric. With the ´JORI configurator´ you can compose the FUGA chair exactly as you wish on the basis of the extensive list of options. Like the entire JORI collection, the TIGRA LANDSCAPE sofa is manufactured with craftsmanship in the JORI production workshops in Belgium and it is available in a wide range of colours of high-quality leather and fabric coverings. Choice between 2 legs, available in different finishings. Recommended price: as of ± 3,900 EUR (incl. VAT) in fabric for a sofa of 190 cm. With the ´JORI configurator´ you can compose the TIGRA LANDSCAPE sofa exactly as you wish on the basis of the extensive list of options. Designer Giraud has succeeded magnificently in this task. The new GLOVE PURE sofa preserves the soul of the classic model with the same accessible look, adjustable armrests and high back for optimal sitting comfort. The new impulse of the GLOVE PURE sofa resides in a number of subtle details, such as the tight filigree frame that culminates in rounded-off corners on extremely fine legs. Further, there is also the discreet piping finish around the silhouette of the sofa, which gives the design a special couture look. The front of the sofa also looks lighter thanks to the finer base. Finally, an extra compact 140 cm width size has been added to the programme, ideal for the (ever more frequent) smaller spaces. Like the entire JORI collection, the new GLOVE PURE edition is manufactured with craftsmanship in the JORI production workshops in Belgium and it is available in a wide range of colours of high-quality leather and fabric coverings. Chassis: in black or mat bronze lacquered. Recommended price: as of ± 4400 EUR (incl. VAT) for a sofa of 165 cm. With the ´JORI configurator´ you can compose the GLOVE PURE sofa exactly as you wish on the basis of the extensive list of options. Like the entire JORI collection, the STELLATO trio is manufactured with craftsmanship in the JORI production workshops in Belgium and it is available in mat black or bronze lacquered with inlay in black glass or leather. Recommended price: ± 650 EUR (incl. VAT) for a table scale 40.